Overlooking one of the most scenic marine areas on Vancouver Island, this breathtaking 1.75 acres of oceanfront offers sweeping views across the sparkling waters of beautiful Maple Bay to the gentle mountains of Salt Spring Island. 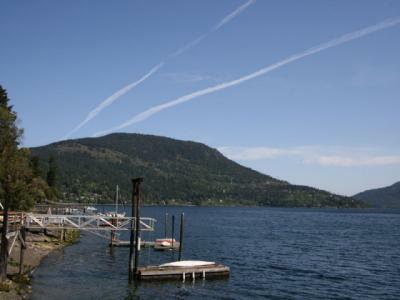 Ideal for boaters and swimmers, this beach front property is located just steps away from the Maple Bay Marina and features an excellent dock with existing foreshore lease. Quality built by the respected SureSpan, it can comfortably moor a 30 ft boat. Mortgage helpers are in place with two charming 792 sq.ft. rental cottages, occupied by long-term tenants. Already selectively cleared to emphasize the majestic view, this fine land is an ideal place to build a seaside dream home. Positioned between Victoria and Nanaimo, and only fifteen minutes from the city of Duncan, this unique property offers an appealing mix of tranquility and convenience. The Maple Bay Marina, with its yacht club, restaurants, and convenience store, is a great meeting point for mariners and locals. Enjoy the abundant leisure activities available nearby, or venture further afield and explore the world class recreation Vancouver Island is famous for.